As I’ve mentioned numerous times, I am a stress/depression baker (for a useful guide, check this out). There is something about the act of baking that convinces me that everything is going to be ok in the universe. So last night when the SF Giants (baseball) were getting their asses handed to them on a barbecue platter in game 6, I needed to bake things to console myself. Unfortunately, I was out of butter (gasp) and didn’t realize this until it was too late to get some from the store. But I figured I have eggs and milk, and I could figure something out. In theory one can substitute oil, but all I have is extra-virgin olive oil and that isn’t ideal for baking desserts. Dump everything into a bowl and mix with a spoon. 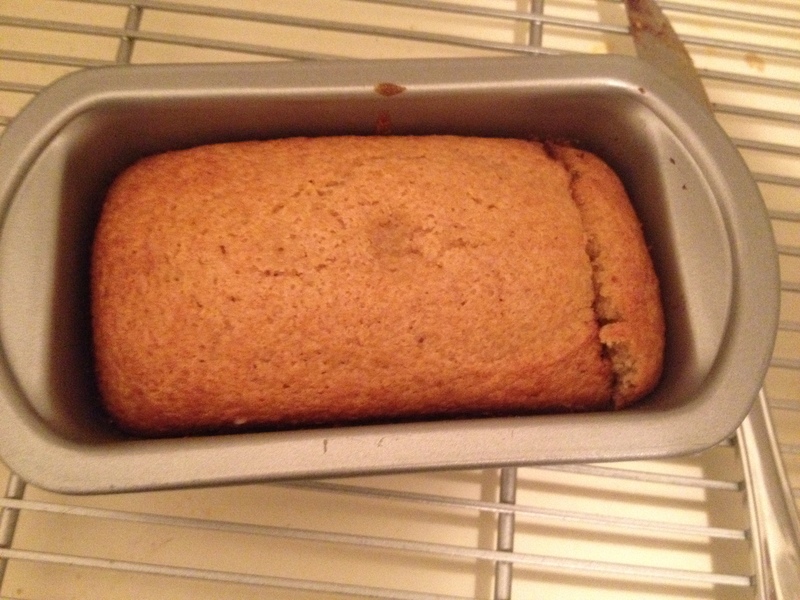 Pour into a mini-loaf pan (you should grease it first – I didn’t and that was not a great life choice). Bake at 350 until puffy and firm, about 30 minutes. Results: Not bad, but definitely not great. It is the baking equivalent of eating a Hershey’s bar, or store-bought cookies – it gets the job done, and you aren’t unhappy with it but its not actually high quality. But hey, if everything I made on my first try was incredible, this wouldn’t be an adventure, now would it. The batter was a little too liquid so all the chocolate chips sank to the bottom. So it was more like chocolate bottom, yellow cake-ish top. Which isn’t a bad thing. Oddly it tasted better the next morning than it did when I cooked it at like 11 at night. I might just finish it as is (its fairly small after all) or I might try turning it into bread pudding or trifle or something of that ilk. We shall see. Song of the week: Bassoon Concerto in E minor by Antonio Vivaldi. I have a soft spot of baroque music – I find it extremely comforting – and Vivaldi is my favorite barque composer. Comfort music for stress baking, but still moody (hence the minor key). When the SF Giants won the National League Championship last Thursday (baseball, for those of you who aren’t sports fans), I knew I had to make a San Francisco-related dish. Unfortunately, the perfect dish, garlic fries, were not something I could really make in my kitchen – it wouldn’t be even close to the same. So I decided to make a recipe from Greens – as it is the definitive San Francisco vegetarian restaurant. Since I needed to make sure there was some Cali/fusion/Mexican flavor in there, I went with Masa Harina crepes filled with veggies. I actually have two fillings for the crepes, one complicated and one simple, depending on how much effort you feel like putting in. And remember, this is authentic San Francisco food, not Mexican food. 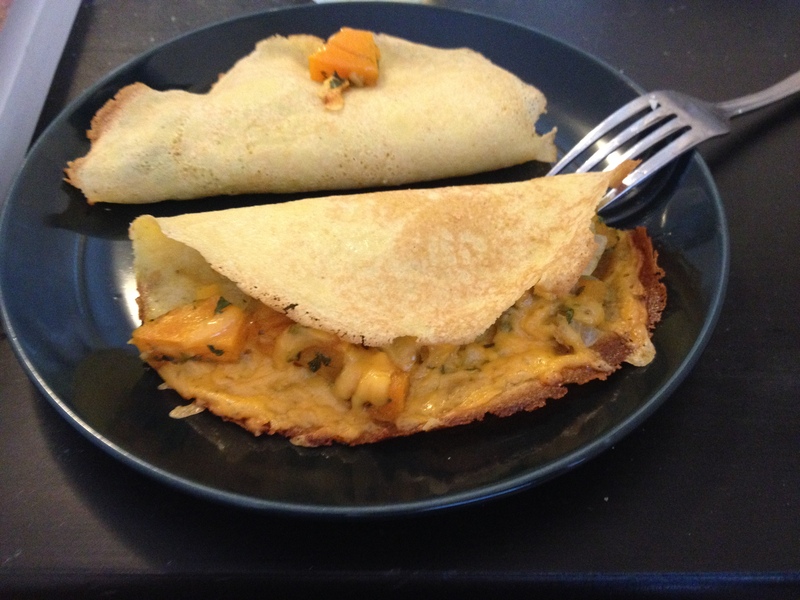 Just like a normal crepe, beat the eggs, then whisk the ingredients into the eggs one by one. Pour about 1/4-1/3 cup of batter on a small frying pan, swirling so that the batter covers the bottom of the pan. Cook, flip, finish cooking and repeat. You should get about 8 crepes from this recipe. Place the aforementioned ingredients into the crepe. Roll up and eat like a soft taco. Roast the butternut squash until tender and stick in a bowl. Saute the onions and garlic in some olive oil. Add to the bowl with the sqaush, add the pepper, cumin, and cilantro and toss. Adjust the spices to your taste. Remember, you can always add more spices in, but you can’t take them out once they’ve been added. Place the filling on 1/2 of the crepe. 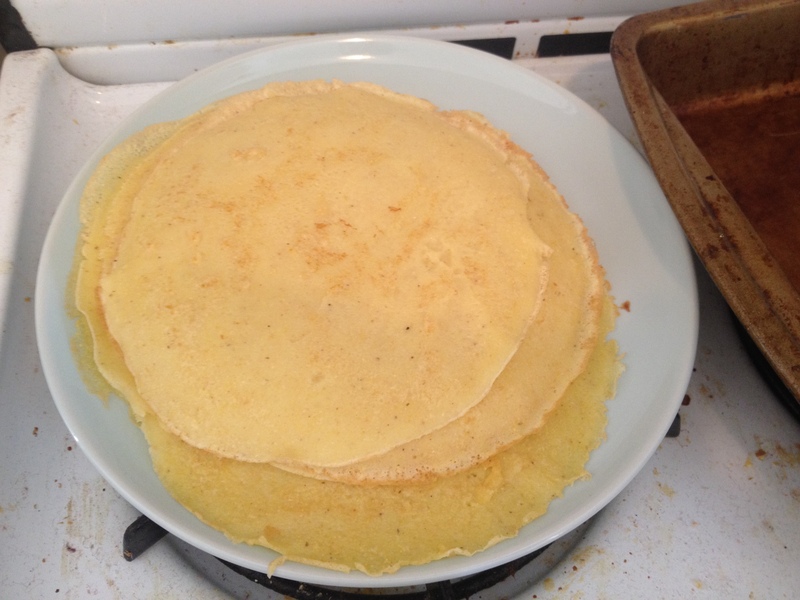 Add grated cheese and fold over, so the crepe is a half-moon. Bake at 350 for 15-20 minutes, or until the cheese is melty and the crepe is slightly crispy. Serve warm. The verdict: Yummy! 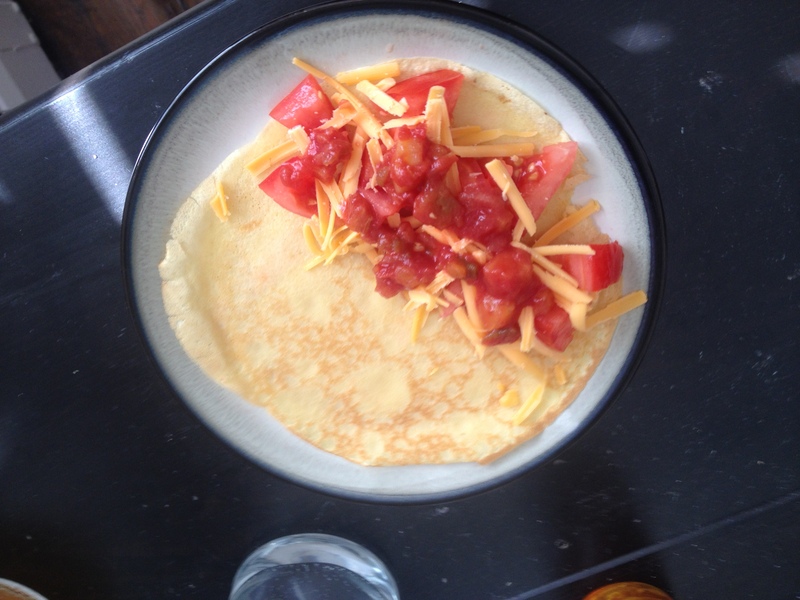 The crepes were definitely a little different, but that just made it fun. The simple filling was good, and the complicated filling was really good. It could have been spicier – it was definitely more on the savory side of things, so you could easily use more cilantro and chili peppers if you want. I liked it the way it was though … ok, so maybe a little more of a kick next time would be ideal. I used to hate cilantro with the fiery passion when I was younger though, and this was the first time I’ve given it a chance in a while. Naturally, you should serve this with a NorCal wine. White is better with Mexican spices then red – it cuts without overpowering or over-complicating things so you should go for a white wine (I consulted with my dad, he agreed). I went with the Chateau St. Jean Fume Blanc. Song of the week: Save Me San Francisco by Train. Self-explanatory. Different vegetables age and decay at different rates. Potatoes can last seemingly forever, while fresh spinach lasts maybe a week. It was this vegetable decay-rate which spawned version number four of gnocchi. According to my dad, I needed to use my older broccoli before my newer kale. 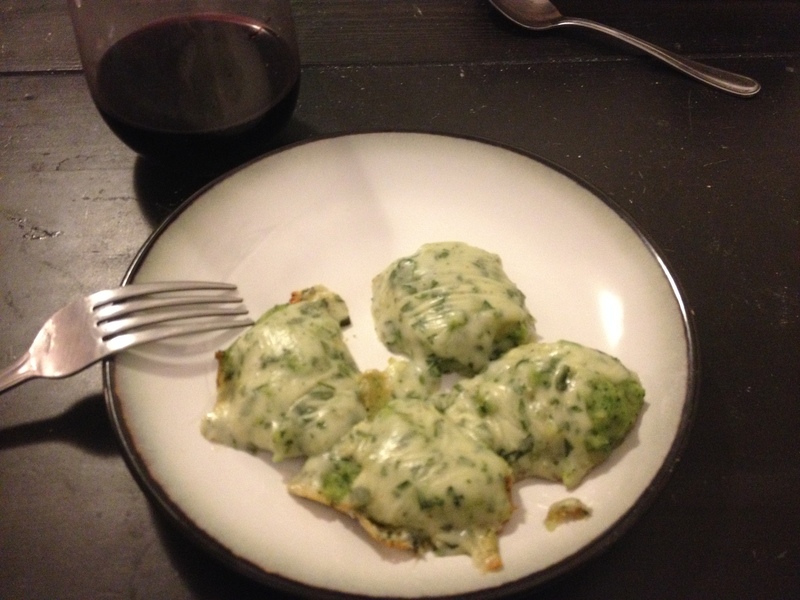 After a few suggested recipes which I shot down, I asked if he you scan and email me the recipe for broccoli gnocchi. Broccoli gnocchi is one of my favorite foods of all times, and I’ve only ever had it when my mother makes it – so it seemed high time I learned to make it myself. The recipe itself comes from the Fresh From France cookbook – one of the first my parents bought when vegetarianism was more difficult and way less mainstream and good cookbooks were hard to find (ie the late 70s and early 80s). Boil the broccoli until tender. Run it under cold water to stop the cooking process, and then puree. If you don’t have a blender or a food processor, then just mash it using the end of a rolling pin (totally works). Combine milk and butter in a saucepan. Heat on low until the butter melts, then bring it to a boil for about 30 second. Add the flour and mix it in until smooth. Once it’s cooled a bit, add the egg. This is the hardest part, because the egg doesn’t want to get mashed in but just keep at it and be patient and it will be fine. Add the broccoli puree and mash everything together. Shape into little oval-pillows and stick in a baking pan with a little space in between each gnocchi. Cover and bake for 15 minutes at 375. While its baking you make the sauce. Melt the butter in a saucepan. Add the flour and mix until its totally combined. Add the milk raise the heat to medium. Stir pretty much constantly to avoid lumps or sticking until it has thickened. Add the cheese, parsley, salt, nutmeg and pepper to taste. Spoon the completed sauce over the gnocchi and stick it back in the oven to bake for another 10 minutes. If you want, you can then finish the dish by sticking it in the broiler for a couple minutes. Serve warm. Like I said, this is one of my favorite dishes, so its not exactly a surprise when I say I loved it. It didn’t turn out quite as good as my mom’s but that will come with time and practice. This is a very fun and different way to serve broccoli, and its definitely not something you will see very often, despite being delicious. I served this with a lighter red wine. I think of it as a fall dish, I I go for reds, but not super heavy ones. Song of the week: Not a song per se actually but a song/comedy routine by one of my favorite duos – the Smothers Brothers. They were mostly popular in the 1960s, and had a variety show – but it was cancelled for being too subversive (ie. liberal and anti-war). Still funny after all these years though. One of the great things about being cook is that there are always new things to explore. And if you’re me, that means that when you run out of ideas, you can just chose a random (or not so random) country and pick a dish. 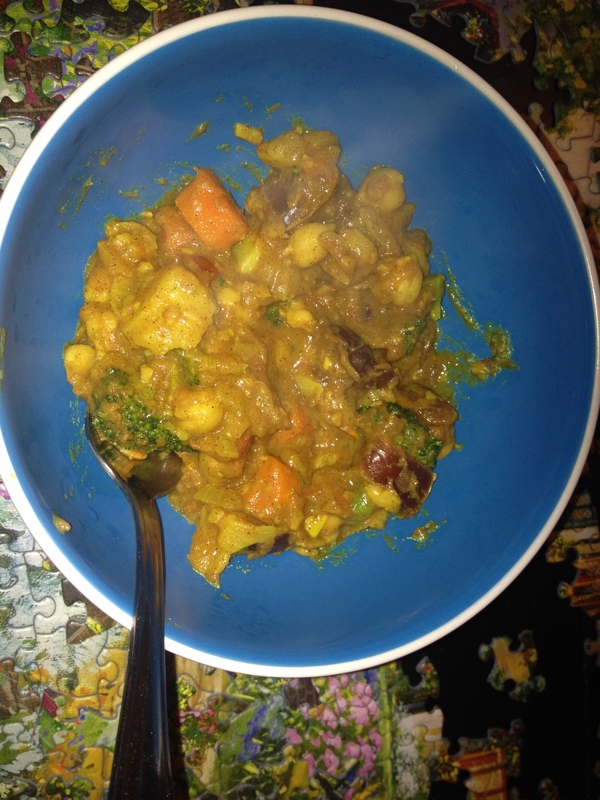 This week, the choice was Morocco, and I decided to be reasonably straight-forward and try a vegetable tagine. Now yes, I am aware that a true tagine requires one of those crazy cooker-thingys, and no, I do not have one. But a saucepan with a lid works just fine, I promise. Pour some olive oil on the bottom of the saucepan, and saute the onions for 5 minutes or so. Add the garlic, spices, carrots, potatoes, and a little water and simmer, covered for maybe 10 minutes. Add the chickpeas, tomatoes, and simmer a bit longer covered, then add the broccoli and dates and let the whole thing cook, partially covered for another 10 minutes or so. Make sure to taste the tagine at each step, so that you get the right balance of flavors for your taste. I had to keep adding more cinnamon and cumin as I went (I started out with just 1 1/2 teaspoon of each and ended up with closer to 3 1/2 of each). When adding spices to something like this, add only a 1/2 teaspoon at a time, that way you won’t over-season. I consider myself a fairly moderate person when it comes to spices – I tend to spice things as much as possible while still being able to taste the underlying ingredients and veggies. I still want a carrot to taste like a carrot. Once the stew is thick, spiced to your satisfaction, and all the vegetables are soft, spoon into bowls and serve. This was an amazing dish. A little complicated with a lot of ingredients, but completely delicious as a result. Super savory, with the dates adding just a touch of sweetness that balances the whole thing out. It also keeps really well and this recipe makes a lot so its great if you want leftovers to bring to work for lunch. I had this with beer, an Oktoberfest to be precise, but if you want to be truly authentic, you probably want to have it with mint tea. Finally, the song of the week is All I Really Want by Alanis Morissette. This actually might be my favorite song by her and I’ve been listening to it a lot lately.